A couple years ago, when the Omnivore World Tour stopped by San Francisco and had surprisingly low attendance for an inexpensive even featuring food and demonstrations from the likes of Magnus Nilsson, Dominique Crenn, Roland Passot, Danny Bowien, and Joshua Skenes. The best thing I had tried in a long time was this tuna prepared by Joshua Skenes, the Saison chef. It almost made me want to spend the ridiculous amount of money to eat at his restaurant, though high end meals generally leave me disappointed because i don’t deal well with heightened expectations. In any case, it’s inspired me to use his simple, but delicious fish curing technique. Just toast some rice–preferably an aromatic type like Jasmine in a dry skillet until browned, then surround the fish with the toasted rice and salt. Put in a tupperware or whatever and leave it in the fridge for a week to a month. Yes, that sounds crazy, but it really works–the rice draws out the usual moisture that causes fish rotting, and you end up with a more concentrated, yet still fresh tasting. (I did let a piece of tuna go for a bit too long once, and it did start to rot, but this was well over the 1 month mark. Skenes finished off the tuna by briefly searing it directly on a large wood coal, which added a nice smoky dimension, but everyday techniques work too. I cured this nicely boned whole trout from Berkeley Bowl for about ten days, wiped off all the rice, and thought maybe I should try to use that too. The toasted rice really smells good. I rinsed it a couple times in hopes it wouldn’t be to salty, then cooked it in the usual rice in a pan method–a cold start with water a little under a knuckle up from the rice surface. Cover and bring to a boil, then turn down to low for 15 minutes or until done. The rice turned out quite mushy, and I probably which could be because I added a bit too much water, given that the rice had already absorbed all that trout water. Next time I might try frying, as the couple of pieces that remained on the trout were good and crunchy, but easy to bite. For the trout itself, I went for the simplest of cooking–skin side down on high in a skillet with butter, olive oil, and scallions. The dried skin crisped up very nicely, and a flip over at the end of cooking (about 4 minutes) finished the thicker center within a few seconds. To finish the dish, I added thinly chopped cabbage to the hot pan, to pick up the fond and brown a bit. I plated while still fairly crisp, but several bits had picked up good bit of browning. I added some sour cream to this mixture, as I’d gotten a bit of a bug in my head after hearing the Simply French combo of salmon on a bed of creamy cabbage was quite good according to chowhound’s cookbook of the month reporters. Of course, this is nothing like the Patricia Wells/Joël Robuchon recipe, as that is typically frenchy, and calls for the cabbage to be boiled, then sautéed in butter, then cream added. All in all, I was very satisfied. 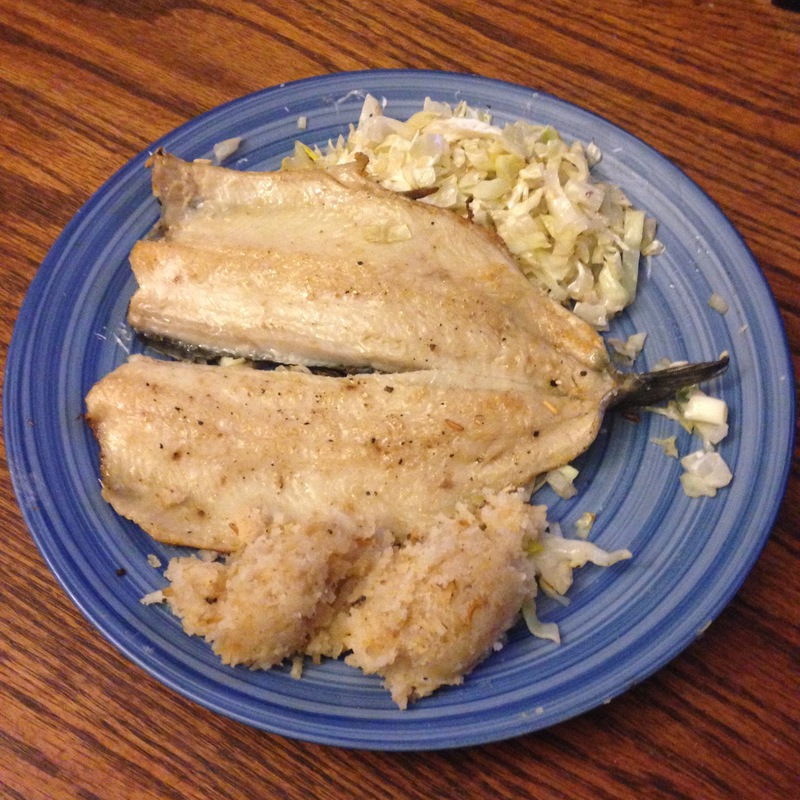 I liked this trout better than the one I stuffed with lemons and baked when I bought them 10 days ago, and I think the fish and cabbage combo worked well. I even enjoyed the mushy rice, as the toasted rice aroma is so pleasing.